A couple of days ago, this image was published as Astronomy Picture of the Day, on NASA’s website of that name. It struck me as a perfect illustration of a point I have been trying to make as I was studying the whole business of the expansion of the universe, the varying interpretations of redshifts, the anomalous observations of low redshift quasars in among high redshift galaxies, the “quantum” explanations of gravitational redshifts, and the like. The image and its “explanation” are taken directly from the website. My comments follow. The CMBR is not, as naive theorists suppose, a leftover from the big bang, an event that never happened. What has been called the CMBR, is, in fact, the image of the background field that permeates both our universe and the extended cosmos in which it arose and in which it currently resides. 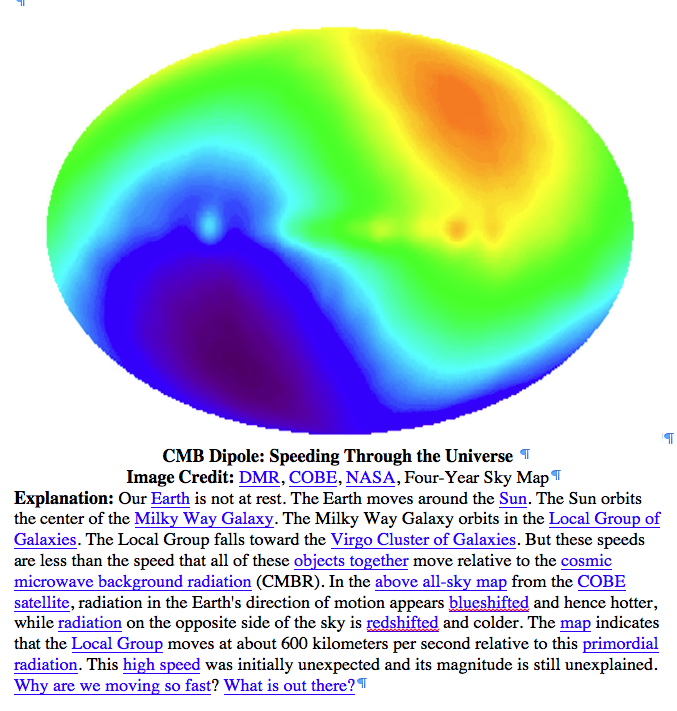 It is, in fact, what our more speculatively inclined peers call “dark energy.” The image above shows the effects of the motion of our local position relative to the fixed reference frame of that cosmos, and explains many previously unknown phenomena, particularly the constancy of “c,” the velocity of light. From any given point our velocity relative to that fixed frame consists of the sum of our earthly rotational velocity, our orbital velocity relative to the sun, the orbital velocity of the sun relative to the Milky Way, the velocity of that galaxy relative to Local Group of galaxies, the Local Group’s velocity relative to the Virgo Cluster, and that cluster’s rotational velocity relative to the cosmos. That is a very large number. We are spinning very fast in this “boiling pot” of the cosmos. The image is, of course, highly color-enhanced, as are most representations of red- and blueshifting, but it gives a dramatic sense to the magnitude of our motion, which, of course, none of us actually feel, as well as dramatic proof of Galileo’s first conceptualization of relativity. What I am trying to explain, in all of my current work, is that it is true that this field is primordial, in that it existed long prior to all of the reality we perceive and all the reality that was there for billions of years before we evolved to observe it. But it didn’t arise out of nothing. It isn’t the cooled-down residue of some explosion dreamed up by an explosion-loving physicist. I can’t explain how it came to exist, but I can demonstrate that it does exist and that it’s existence can explain all that we do see and experience here in this reality that we (temporarily) inhabit.